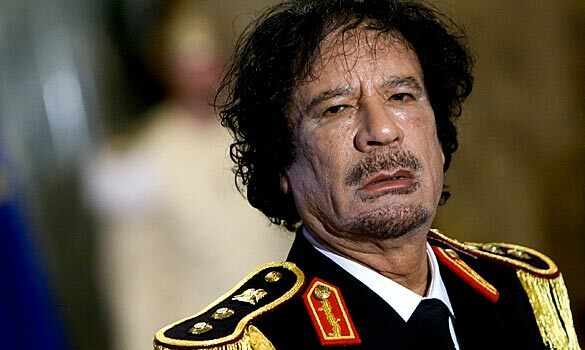 It’s very odd how the demented Gaddafi managed to infiltrate a great number of Britain’s well known public figures, who must now conveniently claim total ignorance of his state of mind and evil intentions towards his own people. When business interests overshadow humanitarian values we seem to become immune to the brutalities of dictators, who will stop at nothing to remain in power. History, the best possible mentor in affairs of state, so often fails to shield us from committing the same mistakes over and over again without any pause for deep reflection. Or is it perhaps that greed throughout the ages has a blinding effect, which afflicts those who seek power and wealth. Hitting Bookshops Next Week: Time for Outrage! Posted on 18/02/2011 | Comments Off on Hitting Bookshops Next Week: Time for Outrage! 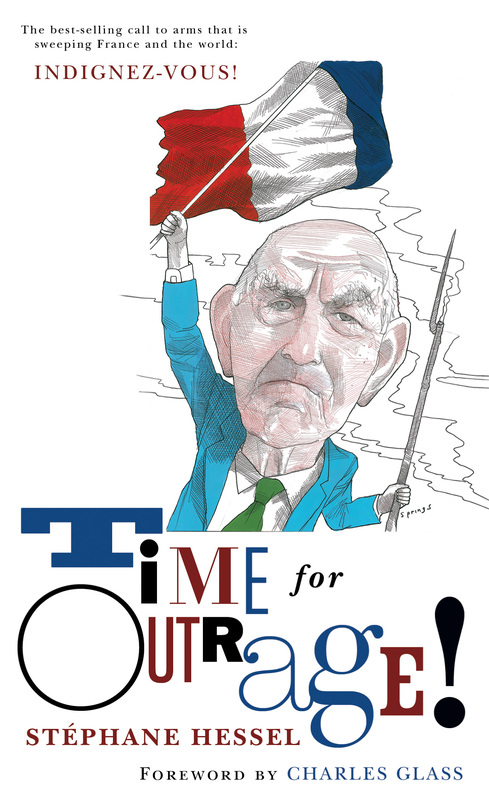 The French edition of Time for Outrage!, Quartet’s new little book, has caused a sensation in France since being published last October. It has broken all records in its country of origin by selling 1.3 million copies in just four months. 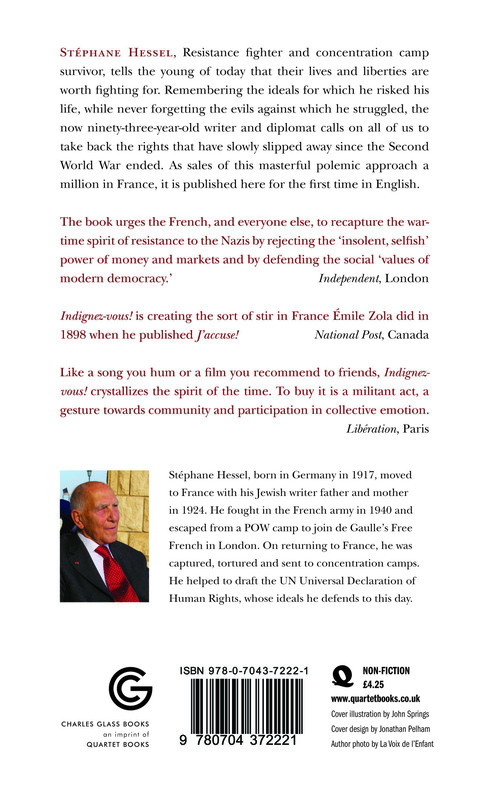 The author Stéphane Hessel was born in Germany in 1917, emigrated with his Jewish writer father and mother to France in 1924 and fought in the French Army in 1940. From a German prisoner of war camp, he escaped to join Charles de Gaulle’s Free French in London. On his return to organise the Resistance in France, he was captured, tortured and sent to concentration camps. He survived to work after the war on drafting the UN Universal Declaration of Human Rights, whose ideals he defends passionately to this day. The German edition has already sold over 100,000 in two weeks – and is still going strong. Let us hope Quartet’s English edition will out-do the German, with its most enlightening Foreword by Charles Glass, the well-known American journalist and author. Comments Off on Hitting Bookshops Next Week: Time for Outrage! The situation in Egypt is entering its most crucial and perilous state. 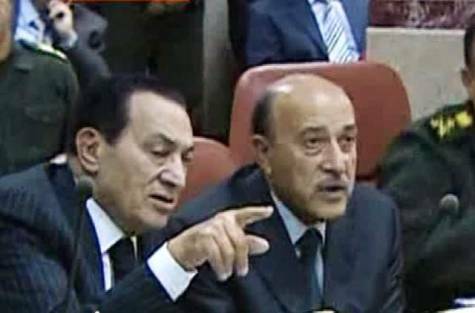 The refusal of President Mubarak to step down is causing alarm not only throughout the Arab world but also among Egypt’s allies in the West. The US position seems to oscillate from day to day, and that in itself is encouraging Mubarak to defy his people, who clamour for his departure. The US administration is now in danger of antagonising the vast majority of Egyptians, especially the young, who are determined to oust the old regime in its entirety and begin the transition to democratic government, free from the abuses they have suffered for the last 30 years under a cruel and corrupt dictatorship, which has milked the nation and enslaved its citizens. The wind of change is a force that cannot be defeated, and the sooner the defunct regime realises it the less the likelihood of any bloodshed to follow. But the message of the demonstrators should be made amply clear: those responsible for the crimes committed, including the theft of the nation’s resources, should be tried fairly and, if found guilty, severely punished. 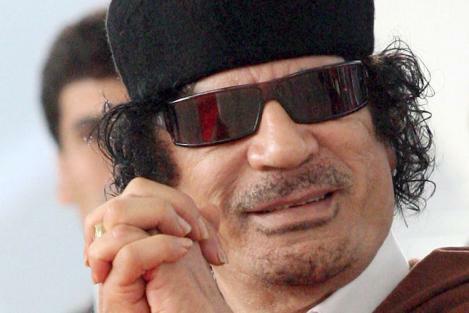 It is time to rid the Arab world of these evil dictators and their cohorts, who have for the last few decades ravaged their nations and spread fear and poverty in order to enrich themselves. Worst of all, they have desecrated the sanctity of human life. Posted on 11/02/2011 | Comments Off on Time for Outrage! This month sees the publication of Time for Outrage! Translated from the French, Indignez-Vous!, Stéphane Hessel’s explosive bestseller is the first title published by Charles Glass Books, a new imprint of Quartet Books. Comments Off on Time for Outrage! Elizabeth Hurley is at it again. Her love life is so varied and complex. Her new lover Shane Warne is reputed to be a serial womaniser. As things go they are well-suited. Hogging publicity in all its forms has become her métier. She revels in being shameless. The revolution in Egypt has so far not achieved the demands the Egyptian people are seeking. The regime is still in total control and refuses to budge. Promises from dictators who abuse their people are worthless. The regime is obviously playing for time and has no intention of peacefully handing over the reigns of power. Their tactic is to divide the opposition by every means at their disposal. In that, they have partly succeeded. The young revolutionaries who started it all must stand firm, now more than ever, for they risk losing what they have already achieved. Professional politicians who claim to be on their side are not to be trusted. They have already proved that their initial stance of refusing to talk to the regime before the ousting of Mubarak has dramatically changed. Their ultimate objective, as with all politicians, is to have power and this is a golden opportunity for them to hijack the revolution to their own advantage. Another factor, which nobody seems to have taken into account, is the role of the army. The army itself is part of the regime and, if it comes to the crunch, they will most likely support their masters. People must not be under the illusion that the present honeymoon between the demonstrators and the soldiers is either permanent or one to be relied on in the long term. Although the demonstrators have gained much, they are not there yet. The road ahead is perilous and the regime, which is brutal and corrupt, is not to be easily cowed. It still believes that it can ultimately win the battle to stay in power. Is the 0.5% Bank Rate a Mirage in Reality? Posted on 02/02/2011 | Comments Off on Is the 0.5% Bank Rate a Mirage in Reality? I was a banker for many years early in my career, but we live in an age now where little of that past experience comes forward to help me understand what is happening with the economy today; so many former sound principles seem to have been turned on their heads. For a start, can somebody please explain to me how maintaining the low bank rate of 0.5 per cent, where it has been since March 2009, is helping the economy to regain momentum? There is indeed a theoretical justification in seeing this as saving the situation from stagnation, but in practice I believe it has the opposite effect, given the flagrant abuse of it that results, as we shall see later. Take a close analysis of what really happens. When, for example, the bank rate was 5 per cent, as recently as April 2008, depositors were able to obtain from the banks a return of 3 per cent from their capital or savings; and alongside this were able to borrow money on average at 2 per cent above the bank rate, i.e. at 7 per cent. Now, with the bank rate at 0.5 per cent, borrowers are asked to pay a minimum of 8 per cent (if they are lucky) while the return on their deposits is virtually nil. In other words, the banks are ensuring for themselves a margin of almost 8 per cent and hence are increasing their profits by a very large portion while the economy is bleeding. The levels of profits they expect to announce by the middle of February (more than £25 billion from Barclays, HSBC, Standard Chartered and Lloyds) are being trumpeted as a successful outcome to help us forget the culpability of banking practices in setting off the global financial meltdown that almost brought the entire system to ruin. But that does not seem to prevent them telling us we should be grateful to them for putting proper safeguards in place that weren’t there earlier; it merely confirms how arrogant and self-congratulatory they have become over the years. Where the government makes a show of knowing how antagonising to the public the spectacle of bankers awarding themselves huge bonuses must be, any attempts at dissuasion look disingenuous when set beside the indirect encouragement it gives them to make as much money as they possibly can and justify their claim that they have earned it. Why do you put temptation in their way when you know how greedy they have become? The consequences of a bank rate of 0.5 per cent also need to be looked at against the background of inflation in the United Kingdom. Driven by the rising price of oil and a threat of world food shortages, the upward trend is beginning to look relentless. In December 2010 it was running at over 3.7 per cent, having been in the range of more than 3 per cent month by month throughout the year, in contrast with the government’s target rate of 2 per cent. It is widely expected to continue its upward trend to reach 5 per cent in the not too distant future. In light of all that, one focus of government concern should be the situation of pensioners, who see the return on their savings heavily reduced even as the challenge intensifies for them to survive amid rising prices. At a time when the rate of personal bankruptcies is generally falling, as people find ways of rearranging or reducing their debts, the number of bankruptcies among pensioners is certainly and disturbingly on the rise. Austerity cuts are also beginning to bite in ways certain to affect the quality of life for older citizens. To add to their woes, the closure of branch libraries is likely to deprive them of many of the recreational lifelines they need to stay active and mentally alert, and to continue to feel in touch with the wider world. As the cuts intensify, they will also inevitably take a toll on jobs, and this will be only one of the added pressures on family budgets to hurt them in a real way as living standards fall and food and energy costs soar. Mervyn King himself has said that the fall in real earnings over the past five years has been unprecedented since the slump years of the 1920s. He predicts that families will pay the ‘inevitable price’ for the financial crisis as they find their disposable incomes eaten up, but that inflation is a short-term problem that will ease. Not everyone agrees. Amid the current financial turmoil, the banks have chosen this moment to push interest rates on credit cards up to an average of 18.9 per cent, their highest level in thirteen years, bringing them additional revenue approaching £10 billion. To service these extra sums, those in debt are likely to be paying thousands of pounds more before their loans are settled. It reflects a policy of squeezing the consumer ’till the pips squeak’, which might be justified, says Lord Oakeshott, the Liberal Democrat Treasury spokesman, if the banks were ‘pouring the profits back into small businesses or first and second time housebuyers. But they’re not. [Their] priorities are bonuses first and big borrowers second, with ordinary customers and taxpayers a bad third’. The banks’ arguments for the increases are that they have to cover the mounting risks from bad debts, unemployment and pay curbs, though the logic of this also has questionable aspects. If the banks make it so hard for their customers to repay, then surely they are increasing the risks they say they fear. The dilemma of small businesses in their battle for survival is another crucial area that needs urgent government attention. Small businesses can be training grounds for skilled staff and centres for dynamic thinking of the sort that’s impossibly constrained in large monolithic organisations. Small businesses are barometers for the health of the economy, yet predictions persist that 2011 will be a dark year for them, with many failing before the more promising pastures of a reviving economy come into view in 2012. Alarmingly, the retiring president of the CBI, Sir Richard Lambert, has brought the government under fire for its lack of a growth strategy. Against the background of their flamboyant headlines on maximising profits, the banks are meanwhile steadfast in a policy of not lending to the small business sector, and the Chancellor of the Exchequer, George Osborne, appears powerless to persuade them otherwise, despite the enormous sums of public money that have kept them afloat. The politics of the situation will start to look ever more dangerous with time if the chancellor fails to get a handle on influencing the banks, and the banks persist in apparently living in a separate universe from the rest of us. To return to the bank base rate of 0.5 per cent, it is evident that it is responsible for stagnating the economy when banks refuse to help ailing companies trying to survive in a recession that has turned out to have a longer-lasting and deeper impact than was previously anticipated. The trend of making the rich richer and the poor worse off has been a feature of the economy since even the days of the New Labour government. The sad result is that we can only expect it to continue and amplify. The weather has been named the culprit for the current unexpected weakness in the economy but, even with that taken out of the equation, it is clear that stagnation would have been a feature for the end of 2010. The economist Martin Weale, a newcomer to the Bank of England’s monetary policy committee, believes that a pragmatic response is needed: it must be made ‘month by month, based on a judgement about the balance of risks and how they have evolved’, while ‘a faltering economic recovery implies human misery and a waste of resources’. Let’s hope his voice is heard. Comments Off on Is the 0.5% Bank Rate a Mirage in Reality?